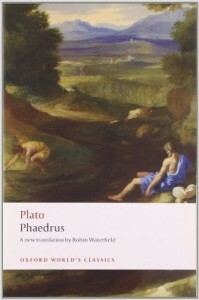 Plato’s opinion regarding a text was that it should be didactic. It should instruct society. But Aristotle questioned Plato’s opinions. He strongly affirmed that a text should be purely aesthetic. Therefore, each critic constructs a different frame around the text. Dr. Faustus is analyzed as a play containing features of the Morality Play and also containing those aspects that are different from it thereby being shaped as a typical Elizabethan or Renaissance play. Context plays a vital role in literary criticism. There are various approaches to a text like the biographical approach (discussing the life and works of an author and trying to relate events in his/her life to the text per se), the historical approach (trying to place the author in a particular age, relating some of the facts or events in the text to the facts/events during that age), the geographical approach (this is popularly called the local colour; for instance, in Dr. Faustus, Marlowe discusses Italy and Rome no doubt, but he also introduces the horse-courser, the ostler, Rafe and Robin – characters who are undoubtedly British and whom Marlowe must have come across or closely observed in everyday life). 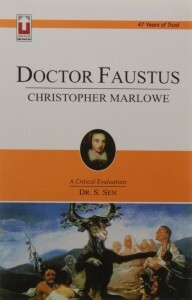 There is also the formalist approach where the text is seen in the light of the age in which the author is placed; for instance, Dr. Faustus is analyzed as a play containing features of the Morality Play and also containing those aspects that are different from it thereby being shaped as a typical Elizabethan or Renaissance play. Here, the form of the play is analyzed (containing aspects of Greek drama like the chorus or hamartia) and the play is also analyzed in terms of the Elizabethan age where drama was the dominant literary discourse. That brings us back to classical literary criticism. Plato’s opinion regarding a text was that it should be didactic. It should instruct society. But Aristotle questioned Plato’s opinions. He strongly affirmed that a text should be purely aesthetic. Therefore, each critic constructs a different frame around the text. The parable of the cave mentioned by Plato is one of the most important contributions made to philosophy. It occurs in The Republic. It is interesting to note that Derrida uses Plato’s Phaedrus to emphasize his views of deconstruction. The parable of the cave mentioned by Plato is one of the most important contributions made to philosophy. 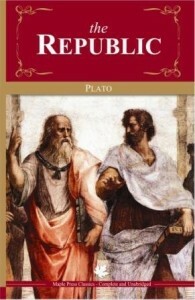 It occurs in The Republic and is attributed to Socrates. A man is in a cave and it is pitch-dark. There are things in the cave and he feels the presence of those things. He sees their shadows but is unable to see them clearly. Based on these shadows, he describes the things that he sees. Philosophy is the light that dispels the darkness and displays reality. It sets the man free from his chains of ignorance and he is able to see things the way they are and not the way he thought they were. In other words, he is no longer looking at shadows but at the things themselves. 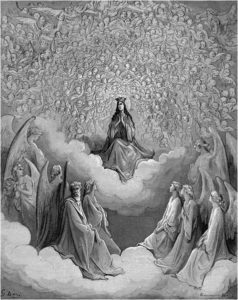 So, this brings us to a three-tier structure: The Ideal or the Perfect that is comprehended by philosophy, the Real that is an imitation of the Ideal, and the Mimetic that is an imitation of the Real. Four schools of philosophy during the Greek period were logic, ethics, epistemology, and rhetoric. Philosophy was elevated to a higher status during this period. Some of the views of philosophers have stood the test of time. For instance, Heraclitus stated that one doesn’t step into the same water twice because the water flows perpetually. It is interesting to note that Derrida uses Plato’s Phaedrus to emphasize his views of deconstruction. 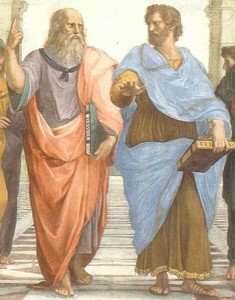 In the middle of the conversation (between Plato and Socrates), Socrates says written instructions will lead to error because there is no one to interpret the writer’s views to the readers. Therefore, speech is primary. Derrida says Socrates’ view that speech is primary has stood the test of time only because it was written down by Plato. Therefore, a text not only says more than what it wishes to say but also the opposite of what the author wishes it to say. Plato relegated actors and writers to a secondary position and set philosophers on the highest realm. Aristotle, on the other hand, relegated philosophers to a secondary position and focused more on actors and writers. Alexander of Macedonia (Aristotle’s pupil and one of the renowned kings in history) relegated philosophers, actors, and writers to a secondary position and placed warriors on a higher level because he was a warrior primarily.